Overcoming mistakes, bouncing back after a bad pass or letting in an easy goal are characteristics of great hockey players. The reality is that you will make mistakes. If you lack the ability to bounce back quickly, you will hurt both you and your team. Trent W. is a left-winger for his junior hockey team. Trent is a strong player but he has difficulty overcoming mistakes. Trent’s scoring ability in preseason earned him a spot on the first line. In the first game of the year, Trent fanned on an easy scoring opportunity. On his next shift, Trent made two bad passes that were intercepted. Overcoming mistakes requires a certain mentality. Your mindset about mistakes, or the way you think, is crucial for bouncing back. 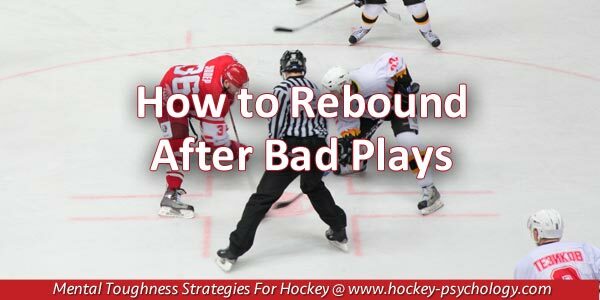 You must understand mistakes will happen to every hockey player that takes the ice. 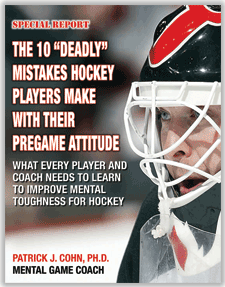 It is impossible to play mistake-free hockey throughout your career. You need a present moment focus. You must be able to shake off mistakes and re-focus your mind and energies on what needs to be done RIGHT NOW! You need confidence. Confidence is the ability to know what you can do instead of what you didn’t do. The one position in hockey where overcoming mistakes quickly is absolutely critical would be goaltender. Many goaltenders have difficulty bouncing back after letting in an easy goal. These goaltenders tend to fall apart after a bad goal then soon let in another easy goal. Sophomore Boston University goaltender, Jake Oettinger, prides himself on his mental ability to overcome mistakes during games. Oettinger played 35 games for the Boston University men’s hockey team last year and received many accolades including 2017 Hockey East All-Rookie Team. In 35 games, Oettinger posted a 21-11-3 record while giving up 75 goals. Oettinger’s positive mentality and ability to bounce back was a major reason for his .927 save percentage. One of the major things that shaped Oettinger’s mindset is that even the greatest goaltenders let up bad goals. The key is to stay out of your head and move on quickly rather than mentally replaying those goals. It’s not uncommon for players to make errors during a game but the great players leave the mistakes in the past. You too can learn effective strategies to bounce back after a bad play and finish the game strong. The key to overcoming a mistake is to react differently than you do when frustrated. This should start in practice where you are under less pressure. What mistakes trigger your to become upset? List these. What makes each mistakes so upsetting? Hint: It’s usually based in your expectations for performance. For each trigger, think of a new way to respond so you can let go of the mistake and move on. The goal is to get unglued from the past. After each practice and game, review how well you bounced back and visualize yourself next time reacting with composure in game situations. 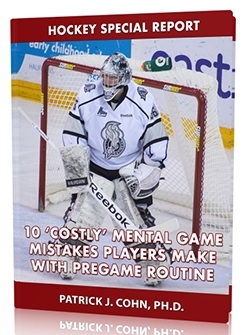 Learn Mental Game Strategies to Improve Composure in Sports! If you’re an athlete who wants to learn how to stop performance anxiety quickly, be poised, calm and in control during those “critical moments”, learn more about The Composed Athlete! Powerful strategies for learning a composed mindset can be developed, but you must first strip away the mental ball and chains that prevent you from having instant composure when you need it. How much better would you perform if you have total confidence and composure to perform your best in crunch-time? 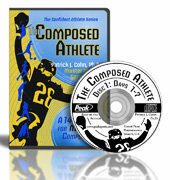 The Composed Athlete CD and workbook program consists of 2 audio CD’s that include 14 days of composure boosting exercises and a simple to follow workbook that guides you through each of the 14 days, helps you apply the strategies, and customizes the exercises to your personal crunch-time challenges and coping with pressure. “A big thanks to you Dr. Cohn! I just can’t get over how much of a wonderful resource you are Patrick for the mental game of motocross! Never in the history of sports have I had such an upper hand with your mental strategies! “Thank you so much for taking the time to work with our team while we were down in Florida. The tips you gave about relaxation and releasing tension before we bat or do anything was very beneficial to me. I find that I even use it during my classes at school.